The greatest realization of Hollywood’s potential can be found not in any movie but in the faces of Humphrey Bogart and Katharine Hepburn. They were among the Beautiful People, yet neither of them is beautiful in any typical, magazine-foldout sense. They had no conventionally striking appearance to make their lives fall into place for them. They became stars, they became great and beautiful, on their own terms, and with their own total conviction behind their movements. 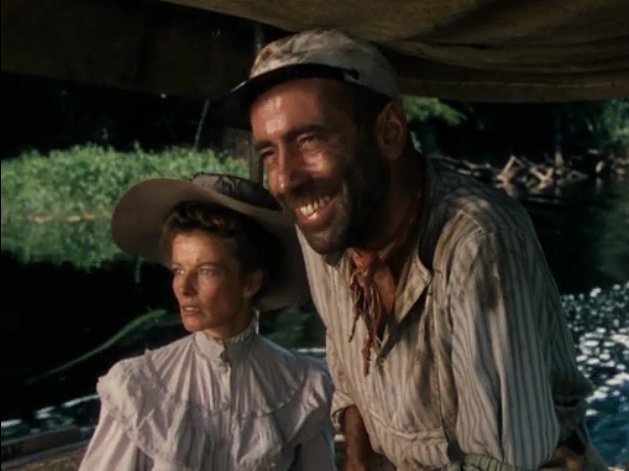 Bogart and Hepburn are willing to do more for John Huston’s The African Queen than almost any actor would do for a movie today. They are thrown into unmarked territory, water tossed on them, mud caked on their faces, dragged and dumped and thrown all over the screen for 100-odd minutes. They do it to serve the cause of a great story. A classically simple story, yes, but a great one, involving nothing more than a prim missionary rescued from a war-ravaged African village by her delivery guy and his rickety boat. 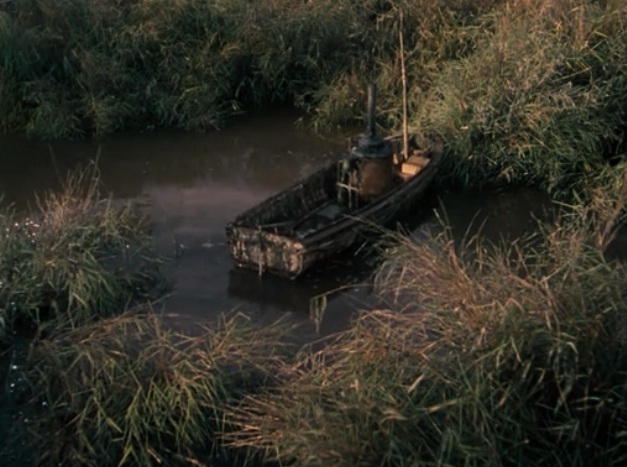 They have a hard enough time battling the elements and dealing with their various conflicts without Hepburn’s crazy scheme to try and win a battle for the British in their creaky, half-dead vessel. If the film is great because of the actors — and it is — it is because they want to make a great movie with a great story, not because they want the movie to be about the fact that they are great actors. Huston must be complimented here as well. Going all out like few Hollywood films of the time would dare to, he paints an uncompromising picture of Africa in vibrant, electrifying color. The narrative is almost scientifically impeccable, taking its central situation to every possible place it could go in your head, truly delivering the goods to the gracious moviehouse visitors who might, more than ever, find that they are themselves traveling on this dubious mission deep in the wet jungle. Huston’s photography of the land is remarkable, of course, but even better is his treatment of the performers, the gleeful way that he sets up our subjective experience of one brief strange moment in our lives, not theirs because their very existence is as servants to this tale, and it becomes ours in a way that so many action/adventure flicks do not. The film’s specters of evil are twofold. 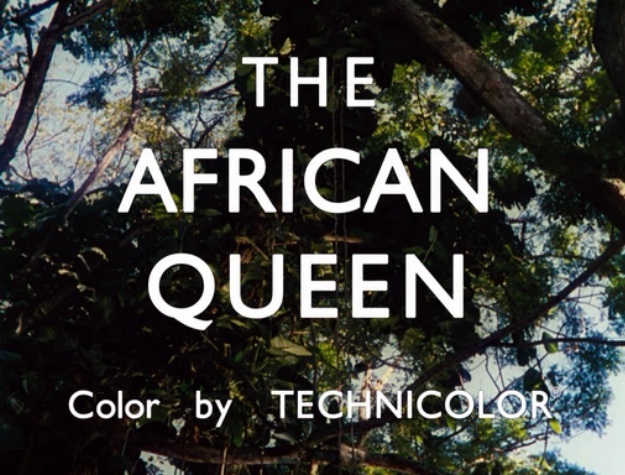 Quite apart from its sense of wartime pregnancy is the way it suffers from not merely the time it depicts but the time in which it was made, in which the stunning photography of an African village in the opening sequence is offset somewhat by the reductionist racism that grows out of the characters’ treatment of the native dwellers. 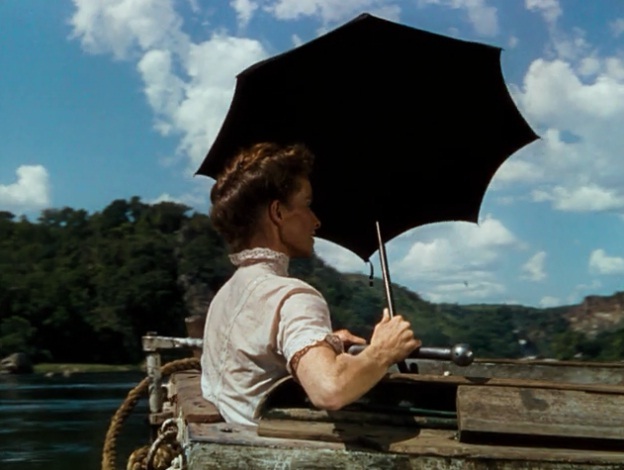 It is, however, a brilliantly barbed comic moment when Hepburn is first seen attempting to lead a large group of bewildered men, women and families in very English hymnal choruses. Once the film gets going, these things cease to matter anyway; you’re too caught up in Jack Cardiff’s gorgeous location photography, some of his best work and among Hollywood’s most eye-popping ever, and the breathtaking action sequences Huston so carefully mounts.